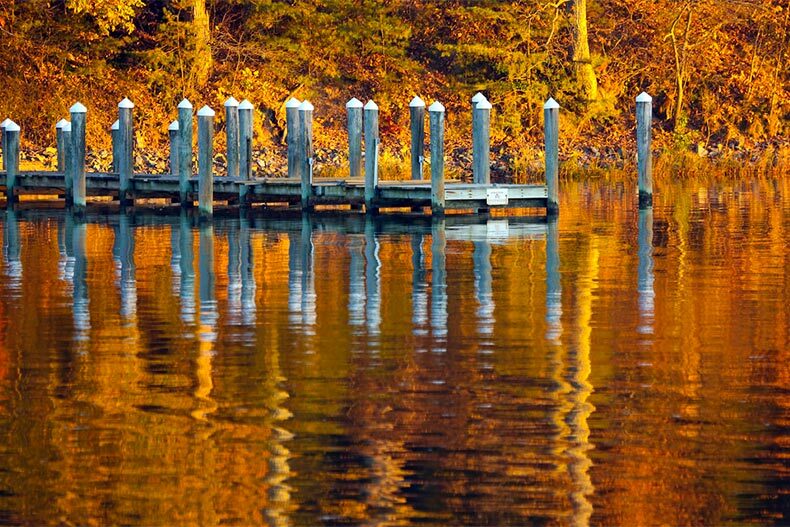 Odenton offers easy access to the shore and green spaces, as well as D.C. and Baltimore. Odenton, Maryland is a suburb located east of Interstate 95 between Washington, D.C., and Baltimore. The town itself might not be familiar, but its central location offers easy travel access for active adults. By car, residents can travel 30 minutes and arrive at the fabulous museums and art in Washington, D.C., the sports and attractions of Baltimore’s Inner Harbor, or the waterfront charm of Annapolis. The MARC Train's Penn Line also stops in Odenton, making it even easier to travel to D.C.’s Union Station or Baltimore’s Penn Station. The MARC Train also stops at Baltimore Washington International Airport, making travel anywhere in the world a breeze. While Odenton is close to the cities in the Mid-Atlantic, the area is actually surrounded by green space. Active adults can hike and bike at the expansive Patuxent Research Refuge. The North Tract near Fort Meade offers extensive trails, while the South Tract provides a wonderful Visitor Center for families and kids. Programming includes bird walks, nature tours, and nature education. The Severn Run Natural Area is smaller with hiking trails. The Severn, Magothy and South Rivers provide easy access to marinas and public boat launch sites. Golf lovers will enjoy private country clubs and golf courses in the area. Here are the best active adult communities in Odenton. The Villages at Two Rivers is a large community on the southern end of Odenton near Crofton and Old Town Bowie. Four builders began construction on homes in 2015 with a plan to build a total of 800 homes. The single-family and attached homes come in a variety of styles and sizes to suit any need. Homebuyers can also choose from energy-saving and luxury options. Although there is plenty to do in the surrounding area, residents can stay active at the expansive clubhouse, including swimming in indoor and outdoor pools. Outdoor spaces including places for gardening, walking and biking trails, a nature center, and a dog park. Cedar Ridge and Gatherings at Forest Glen are two 55+ condominium neighborhoods located within the planned community of Piney Orchard. These homes are well-suited for active adults who want to live in an age-restricted neighborhood but don’t mind being part of a larger community. Piney Orchard is a gated, planned community of 4,500 homes, and residents are welcome to use the community’s fitness center, outdoor pool, and shopping center. Both Cedar Ridge and Gatherings at Forest Glen also each have their own clubhouse, meeting room, and a fitness center. Cedar Ridge is a larger neighborhood with 450 homes and its own tennis courts and bocce ball courts, but only offers one condo model. Gatherings at Forest Glen includes 189 homes in four different models. The Villas of Rock Oak are also associated with the planned community of Piney Orchard. This small neighborhood of 38 attached homes is age restricted. Unlike Cedar Ridge and Gatherings at Forest Glen, the Villas of Rock Oak do not have their own age-restricted amenities. However, residents can enjoy the general Piney Orchard amenities, including the clubhouse, exercise room, indoor pool, outdoor pool, and tennis courts. Homes are two- and three-bedroom with an attached garage and the homeowners association takes care of basic maintenance in the neighborhood.